This year, Easter and Earth Day fall only a day apart. What does it mean for Christians today to celebrate Earth Day in a very real sense after Easter? A new resource produced by Justice Ministries includes a reflection highlighting the world-renewing power of Christ’s resurrection and the speech God gives at the end of the book of Job to explore the love and care God has shown for creation—and our need as Christians to demonstrate that love and care too. 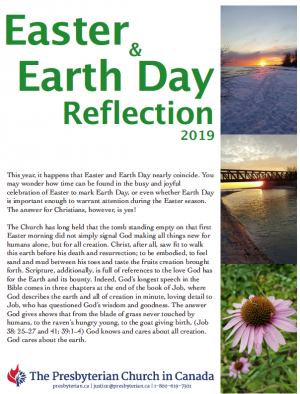 It also includes a study guide for the Accra Confession of the World Communion of Reformed Churches (a confession focused specifically on economic and ecological justice from a Reformed Christian standpoint) and a Call and Response prayer for Earth Day. To order free printed copies, use the online order form (under Featured Resources) or contact the Communications Office at 1-800-619-7301 ext. 331.